75043 AT-AP is a Star Wars set released in the first 2014 Star Wars wave. 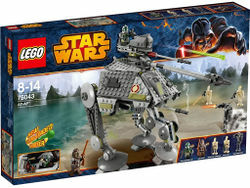 It includes five minifigures: Commander Gree, Battle Droid, Battle Droid Commander, Super Battle Droid, and Tarfful. This is a description taken from LEGO.com. Please do not modify it. 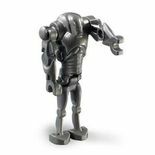 (visit this item's product page) Enter the battle of Kashyyyk with the tri-leg AT-AP™ walker! At the Battle of Kashyyyk, Clone Commander Gree™ and Chief Tarfful™ open the top hatch of the heavily armored AT-AP™ and jump in. With an elevating blaster cannon, new rotating top-mounted, spring-loaded shooter and extending third leg to help it stomp over the roughest surfaces, those Droids had better start running! 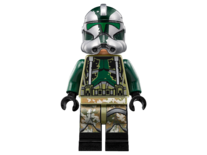 Includes Clone Commander Gree™ and Chief Tarfful™ minifigures plus Battle Droid™, Battle Droid™ Commander and Super Battle Droid™ figures with assorted weapons and an accessory. Enter the battle of Kashyyyk with the tri-leg AT-AP™ walker! This page was last edited on 16 July 2016, at 17:11.